Mr. Reagan sketched these images for a cancer charity benefit in Los Angeles back in the 1980's. Most celebrities who donated to the event provided simple cartoon doodles but the depth of work on these images is truly remarkable. Mr. Reagan chose to draw three images from his ranch in Santa Brabara. 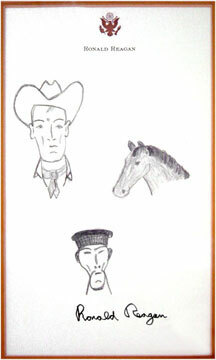 The first is a self portait of himself in a cowboy hat, the second is a horse & a third is one of the ranch workers. This piece is hand signed by Ronald Reagan in black sharpie & was created on his personal Presidential stationary. Measures 10" long by 6" wide. © 2004-2019 LuxuryCity.Com - Images are digitally watermarked.